Cats and dogs are two of the most popular pets around. Both offer unmatched love, support and companionship. It’s only natural that pet owners want to bring their cats and dogs everywhere they go –even to the grocery store. In fact, it’s a common practice for people to allow their pets to ride with them in their cars. 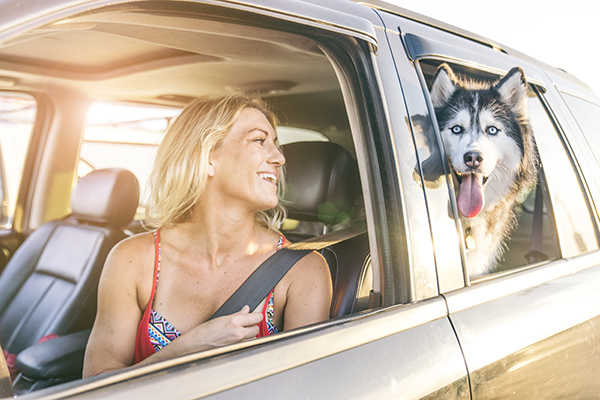 Many pet owners enjoy the experience of travelling with their beloved furry friends. Although pets may have their own individual personalities, in general, most cats won’t be very happy about car rides. A lot of cats prefer to be in control of their environments, and riding in a car means that they’ll be confined in a moving vehicle. Again, all cats are different and it depends on the cat’s level of comfort with travelling. Our team at CarRegistrationAdvisors.org recommends dogs as car companions, instead. Dogs are a lot better suited to becoming regular passengers, because they do not tend to get nervous when going to new places. Dogs also adapt much easier to new environments. Still have doubts and concerns? The writers at CarRegistrationAdvisors.org have compiled a list of the reasons why dogs are better driving companions than cats. Cats are creatures of habit. Generally speaking, cats prefer consistency and familiarity. For example, it takes many cats several months to get used to a new home after moving. Although they might eventually get used to riding in a car, few cats will get used to going to different places with so many new people, smells, and things to do. Dogs are more versatile than cats in terms of travelling, because they respond much more positively to change. Although some dogs may get a little nervous when confronted with a new environment, the nerves normally subside after a few hours. The majority of dogs do not become significantly stressed in the least when travelling somewhere new. Our team at CarRegistrationAdvisors.org notes that one of the traits that many cat lovers admire about cats is that they are completely independent. The majority of cats require little supervision, and don’t even need to be taken for walks to do their business. The drawback to cats’ independence is that they have their own agendas, so to speak. If a cat is not in the mood for a car ride, expect some spitting and scratching while trying to get the feline into the car. Dogs, on the other hand, are known for being laidback and ready for almost anything. A lot of dogs will have no objection to being taken for a drive at a moment’s notice. In fact, plenty of trained dogs enjoy riding in the car. Some people even allow their dogs to ride in the car as a treat. However, one of the disadvantages of travelling with a dog is that their love of companionship may mean that they need a lot of attention. While cats may not need to be monitored in the way that dogs usually do, cats are not likely to appreciate the idea of travelling when they are not particularly in the mood for it.